While researching the latest wedding trends, I came across a wedding magazine called Weddingstar, and fell in love with it. What’s great about it is that they offer so many ideas for brides and event planners. Best of all, everything that is featured can be purchased either directly from the magazine, or from the website. 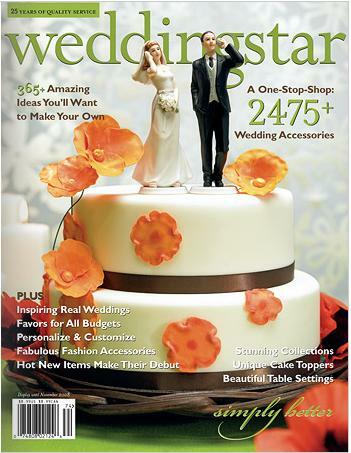 In the latest issue they have over 2,475 wedding accessories. On pages 108-109 they have a beautiful silver and black table setting that has given me inspiration for a new invitation sample. If you don’t have time to make it the bookstore you can always browse the magazine page by page at their website.Enjoy planning your wedding! This entry was posted in Wedded Bliss and tagged Wedding Accessories, Wedding Planning, Wedding Resources, Weddingstar Magazine. Bookmark the permalink.